Thanks to Dr. Raul Gonzalez, Vanderbilt University Medical Center, Tennessee (USA) for contributing this case. To contribute a Case of the Week, follow the guidelines on our Case of the Week page. (1) At the suggestion of Dr. Ari Leifer, we have introduced a new Updates page, which will list updates to the Surgical and Clinical Pathology textbook portion of PathologyOutlines.com, accessed from the center section of the Home Page. This includes new / updated topics by reviewers, new images, and updated / corrected information. It will NOT include changes to the pages which are not part of the textbook, such as the Jobs, Conference and Fellowship Pages and the Vendor pages. Some of the news previously posted on our Blog will now be posted on the Updates page. We are working on the backlog of images from other contributors, and are also posting images from Webpathology.com, from reviewers and from the Case of the Week. 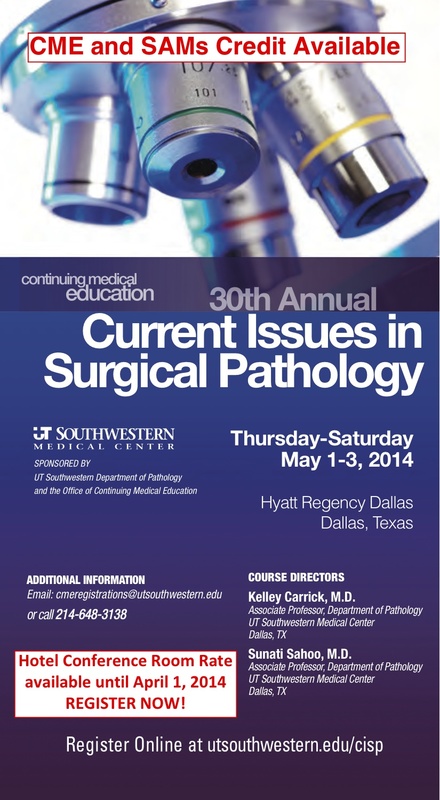 (3) We received a comment about establishing a Forum for pathology related questions. Is this needed, or does this already exist? Let me know what you think. 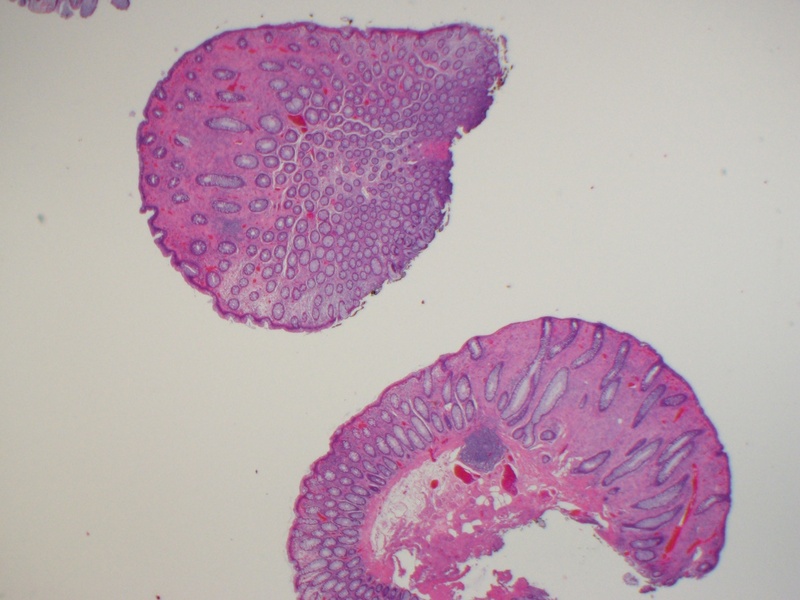 A 63 year old man with a history of tubular adenoma presented with a new colon polyp. 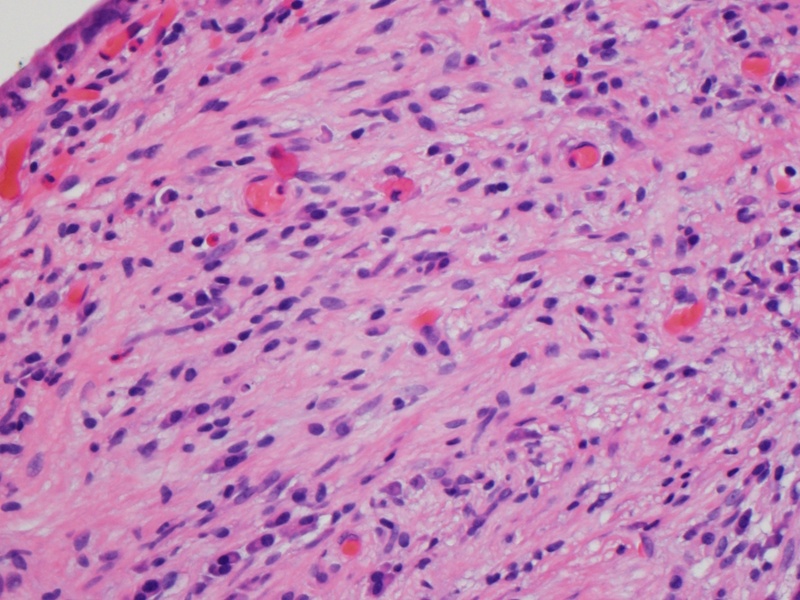 Ganglioneuroma is a rare, benign, slow-growing, peripheral neuroblastic tumor characterized by ganglion cell hyperplasia, nerve fibers and supporting cells. It derives from sympathetic neuronal cells and occurs mostly in children. 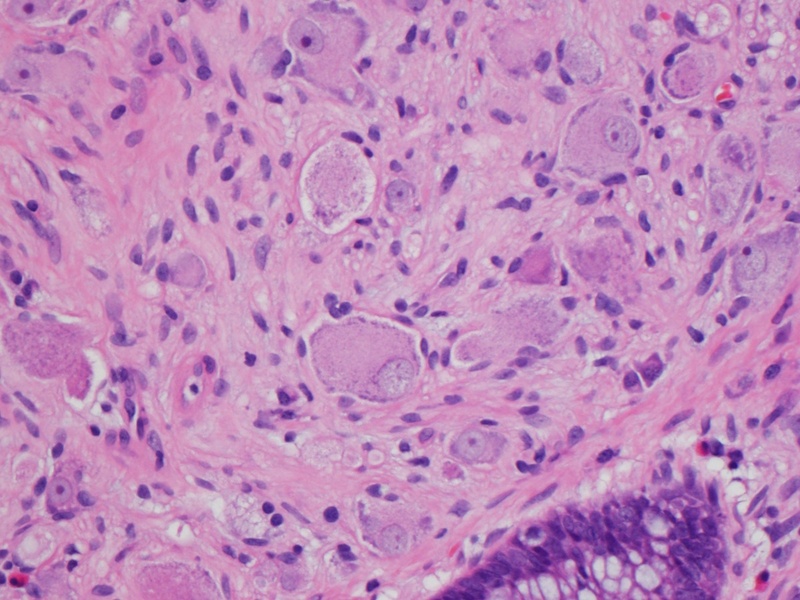 It is found in various anatomic locations, but only rarely in the colon, where it is associated with multiple endocrine neoplasia type IIB (MEN IIB), neurofibromatosis type 1 (NF1), juvenile polyposis, polyposis coli, tuberous sclerosis (J Med Case Rep 2012;6:304) and the PTEN hamartoma tumor syndrome (which includes Cowden and Bannayan-Riley-Ruvalcaba syndromes, World J Gastroenterol 2014;20:1833). 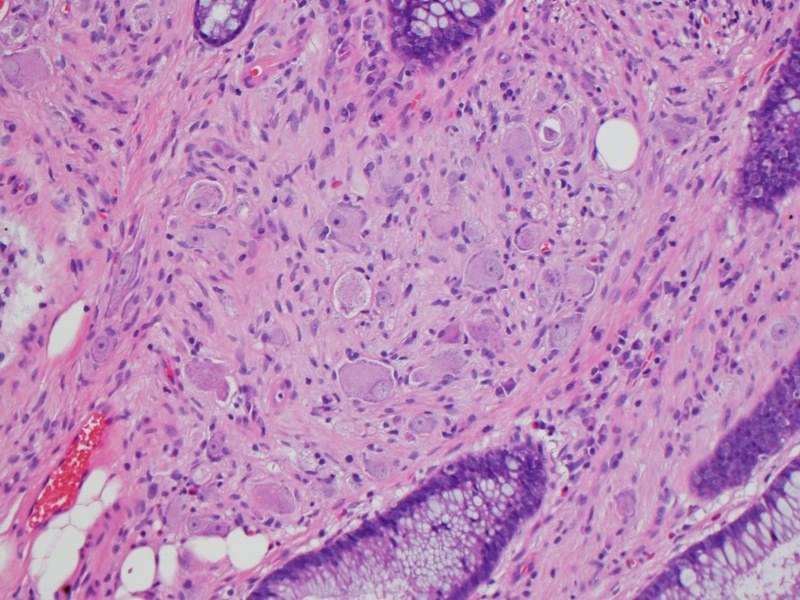 Syndromic cases tend to be associated with ganglioneuromatosis, not solitary polyps. 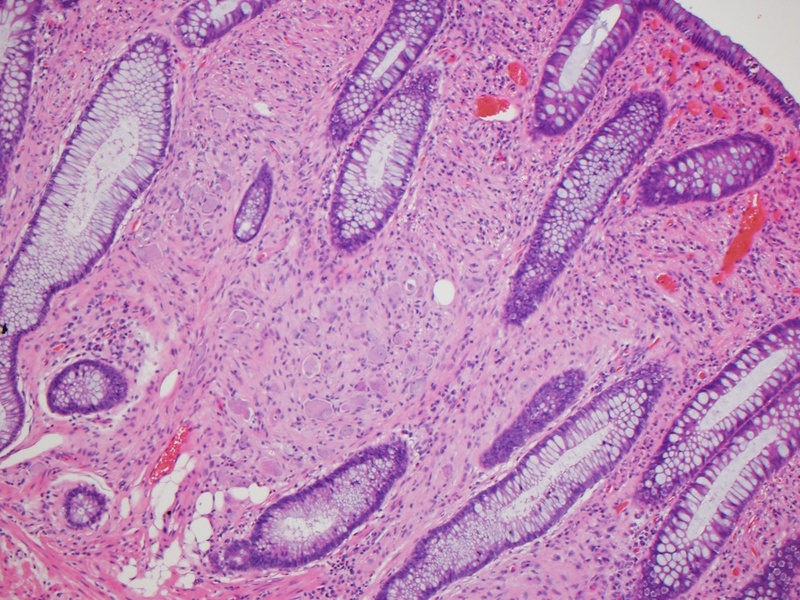 Solitary polyps are often incidental findings at endoscopy, although they are rarely associated with colonic intussusception (J Pediatr Surg 2009;44:e17). Excision is adequate treatment.